Are you wondering about using Bluehost? Did you know that WordPress is the no.1 content management system in the world? Almost every top website like TechCrunch, BBC, Sony Music, MTV is using WordPress to run their sites. That itself tells the importance of using WordPress as your blogging platform. But WordPress management is NOT easy. You need to get a web hosting service to have full control over your sites. That’s why it’s crucial to invest your time and money on the perfect hosting. The #1 important factor for any successful website is the web hosting. Most people are not aware of the importance of choosing the right web hosting to run their WordPress sites. If you are unsure about which web hosting to pick, I highly recommend you to give a try to Bluehost. WordPress itself recommends Bluehost for its users. But most of the Bluehost reviews you find online are completely biased and majority of them don’t cover the hidden benefits and uses of using Bluehost to run your WordPress sites. In this page, we’ll cover those details. So without much ado, let’s now talk about few hidden features and benefits of using Bluehost to run your WordPress sites. If I had to start blogging from scratch, the #1 thing I give importance to is web hosting security. Web hosting plays a crucial role in your website speed and security. If you are hosting on a unreliable or cheap hosting service, you might either face frequent downtime issues or your site might get easily hacked by others. So it’s essential for you to install your WordPress sites on reliable and unbreakable hosting providers such as Bluehost. Bluehost offers all the necessary security features like SiteLock, SSL certificates, daily backups etc. Bluehost performs daily security scanning to identify if there are any vulnerabilities in your site and protects your site against threats from hackers or crackers. Here are few security features that are covered in Bluehost SiteLock system. XSS Scripting: Checks for cross-site attacks that allow hackers to use your website to solicit your customers. SQL Injection: Checks for database attacks where sensitive customer information is stored. App Scanning: Checks all applications that have been installed (WordPress, Flash, etc.) for vulnerabilities. Quick tip: If you are looking for a web hosting, make sure to give top priority to the security features offered by different hosting services first. Then, give a thought to the pricing and also make sure to read the customer reviews on Google who are already using the hosting that you want to try. That way, you can get a better idea about particular hosting service of your choice. Most beginners who want to use Bluehost don’t know one thing. They don’t know that Bluehost offers various hosting plans for various budgets. Among all, shared hosting is the widely used and most affordable option for the starters. You don’t need a VPS or dedicated hosting from Bluehost or any other hosting service when you are just starting out so go for shared hosting as it’s affordable and you can easily run your WordPress sites without any hassle. If you are just starting out, I highly recommend you to pick shared hosting from Bluehost instead of looking for other options like VPS hosting or dedicated hosting. And there are 3 pricing packages offered in Bluehost shared hosting. Here are the quick details about their 3 shared hosting plans so you can easily pick the best one that suits your blogging needs. #1. Basic plan: It costs you just $3.49 per month. This is the cheap shared hosting plan you can avail from Bluehost. But you can host a single website with 50 GB space. This is perfect for the starters. #2. Plus plan: This plan costs you $5.95 per month and you can host up to 10 sites without paying them anything extra. This is perfect for bloggers and affiliate marketers who are planning to run multiple domains or sites by hosting on just one host. #3. Business pro plan: This is the advanced Bluehost shared hosting plan which costs you $13.95 per month. This gives you unlimited access to everything such as hosting space, transferring files, parking domains, managing email accounts etc. Their shared hosting plans include the following things. Most website and blog owners still don’t know about Bluehost money back guarantee. In their Bluehost reviews, they frequently mention that Bluehost offers a 30 days money back guarantee where in reality, Bluehost actually offers ANYTIME money back guarantee. That means, if you cancel within 30 days you receive a full refund on your hosting service. If you cancel after 30 days you receive a prorated refund for the remainder of your hosting term. If you pay them for 1 year and if you are not satisfied with their features or service, you can get your full money back if you raise a ticket with their support team within the 30 days of the purchase of your hosting. Or if you are not satisfied after a month (let’s assume you asked for a refund after 2 months), Bluehost still gives you the remaining 10 months money that you paid them. Most hosting services don’t offer this kind of feature. They usually offer a 30 day money back guarantee and if you ask for a refund after 30 days, you won’t get any penny (even if you paid for annual hosting). So that’s a good news for those who want to give a try to Bluehost hosting service. Quick note: Their money-back guarantee applies to hosting plans, but does not apply to most add-on products, such as domains. If you are an Indian blogger, you might be wondering which one to use: either Bluehost.com or Bluehost.in to run your WordPress sites. Let me explain you the difference between Bluehost.com Vs Bluehost.in really quickly here. If your audience are international, go for Bluehost.com (it has some exclusive features and you will be charged slightly more than that of Bluehost.in hosting when considering the price conversions). If you are just targeting the Indians, go for Bluehost.in. But I highly recommend you to go for Bluehost.com if you are unsure about what to pick among the two as you can use dollars (even PayPal) to pay for your hosting plans. If you are already using another web hosting service (such as A2 hosting, JustHost or HostGator) and want to migrate to Bluehost, you need to either do it by yourself or you need to pay extra money for Bluehost for the site transfer. Here’s what you will get from site transfer service from Bluehost. Complete migration: Bluehost team will migrate your site completely along with up to 20 email accounts from previous hosting to the new. Uninterrupted transition: No hiccups while migrating your site. They have a team of experts to migrate any site really quickly without any hassles. No issues: Once migrated, you review your websites to verify that all is functioning as expected. You can also enjoy the security and convenience of 24/7 support long after your migration is completed. Most bloggers don’t tell you about the Bluehost $200 marketing offers. You can use these marketing credits to promote your site on Google AdWords, Bing ads etc. Here’s how to use their marketing offers on Bluehost. Login to your Bluehost account and open your cpanel for your account. Find the group of icons labeled “Promotional”. Quick note: Once you have spent $25 on Google Adwords, you’ll automatically receive an additional $100 in advertising. Most people don’t know that Bluehost offers a wide range of hosting plans which are listed below. Let’s talk about each one of them briefly so you can understand what they are all about and what they actually offer. Shared hosting: Bluehost shared hosting plans start at $2.95 per month and these are the cheapest hosting plans from Bluehost where you can get features like free SSL, unmetered bandwidth, email accounts and so on. Optimized WordPress hosting: Bluehost WordPress hosting plans start at $19.95 per month and it is exclusively made for WordPress sites. It offers exclusive features like dedicated IP addresses, managed hosting, super fast servers, automatic WordPress updates and so on. VPS hosting: Bluehost VPS hosting plans start at $18.99 per month and these are the widely popular hosting plans from Bluehost where you can get features like free SSL, SSD storage, increased power and more flexibility over your websites. Cloud hosting: Bluehost cloud hosting plans start at $6.95 per month and these are the safest hosting plans from Bluehost where you can actually store all of your data on the cloud and there will be no issues of website downtime, security and so on. Here are some of the incredible things that Bluehost offers but only few bloggers know about them which are actually helpful. Free SSL certificates: Bluehost made it mandatory to offer SSL certificates (which turns your http version to https secured version) with all of its hosting plans including shared hosting plans. Free domain for 1 year: Whether you know it or not, Bluehost offers you a free domain name for 1 year with of all its hosting plans. Usually domain name registration for 1 year costs you anywhere around $10 to $20 depending on the service you choose, so you’re saving all that money with Bluehost. Not only that, Bluehost offers you a unique feature called domain manager which makes it easier for you to track, update, transfer, purchase and monitor all of your domains at one place. SSH access: SSH access (referred as Secure Shell) which is also known as Secure Socket Shell, is a network protocol that provides administrators with a secure way to access a remote computer. In simple words, the SSH protocol is a method for secure remote login from one computer to another. Apart from the above, Bluehost also gives you access to the following things to easily safeguard your websites. With Bluehost hosting, you also get access to Apache SpamAssassin for free which is the #1 Open Source anti-spam platform that helps you classify email and block spam such as unsolicited bulk emails with ease. Most hosting companies offer customer support but majority of them don’t provide you live chat support which is available around the clock. Fortunately Bluehost offers it. From web hosting to domains, any help you required regarding Bluehost can be discussed with Bluehost expert customer support time 24/7 throughout the year. Apart from live chat support, Bluehost also offers you, dedicated toll free numbers for both US and international customers so you can pick up your phone and get in touch with their customer support staff if you need assistance urgently. You’ll also get access to Bluehost knowledge base where you can find a ton of tutorials and videos to do everything from installing WordPress to managing your domains and so on at one place. Backups: Most people who are new to web hosting world don’t know that Bluehost offers automatic backup updates of your site. In fact, Bluehost automatically creates daily, weekly, and monthly backups of your entire hosting account. That means, you can easily restore all of your website’s data including blog posts, pages, images, attachments etc with just one click. Multi-Server Management: Do you need more than one account with Bluehost? No problem, you can easily add shared, VPS, dedicated services or any other hosting services offered by Bluehost to your account really easily. Simply login to your Bluehost control panel once and you can manage all your web hosting services from Bluehost at one place. Content Delivery Network: Another biggest benefit of using Bluehost is that CloudFlare is integrated directly into your hosting account. Whether you know it or not, a CDN also known as content delivery network automatically increases the performance and speed of your website. The best part is that, you can enable CloudFlare from your Bluehost control panel instantly on any of your websites for free. 1-click installs: Bluehost offers “Easy WordPress 1-click installation” where you can install blogging platforms like WordPress from Bluehost dashboard just with a click of mouse. 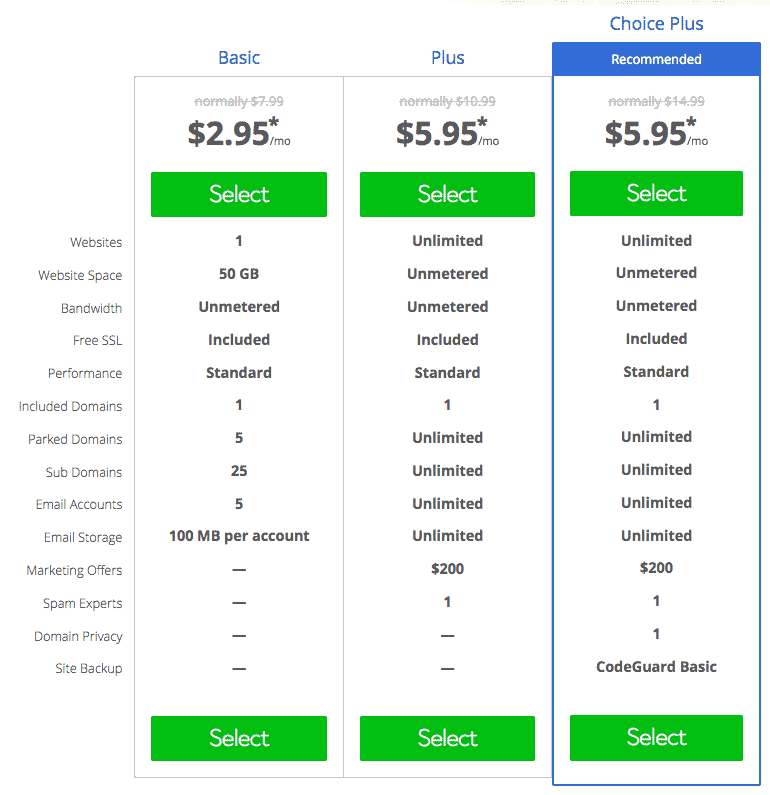 Unlimited everything: From hosting unlimited sites to bandwidth and storage, you can get unlimited of everything (even with the shared hosting plans) which is a great reason most bloggers opt for Bluehost over other hosting choices. Majority of the bloggers use Bluehost shared hosting to run their WordPress sites because of its affordable pricing. Yes, there are so many other great choices out there such as WP Engine, WPX hosting, Siteground etc but they are all expensive. They cost you $30 per month at an average and here’s where Bluehost wins the race by offering their hosting plans at just $3.95 per month. No other hosting service provides so many unique features as Bluehost does at an affordable price tag that only Bluehost can offer. So if you are looking for a reliable, WordPress recommended and affordable hosting to run WordPress sites, you should definitely consider using Bluehost. I’ve been using their hosting for over 5 years now and I never faced any hosting related issues whatsoever. If you search for the keyword “Bluehost review for WordPress”, you will find thousands of articles on Google search results. Not every piece of content that you find online gives you precise information about Bluehost hosting. Most people write biased reviews about using Bluehost to increase their affiliate sales. For a change, I tried to cover as much as “hidden features of Bluehost” by giving you the honest details about their hosting services and other charges. Also make a note that, Bluehost is used by over 2 million users worldwide and they are in the hosting industry for over 2 decades now so they know how to provide unique features to run your WordPress sites fast and secure. I hope this article helps you to decide whether using Bluehost is right or not to run your WordPress sites. Do you have any questions? You can reply in the comments section, I’d be glad to respond.